You are currently browsing the tag archive for the ‘WIRES’ tag. This is an extreme example of poor netting technique. 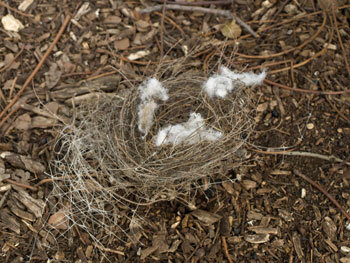 It’s easy to see how wildlife can become entangled in this. Unfortunately WIRES, Sydney Wildlife & the RSPCA have all contacted Marrickville Council about the large number of wildlife rescues they have needed to do in Marrickville LGA because residents have been using netting in their gardens that is dangerous to wildlife or not correctly installing netting. 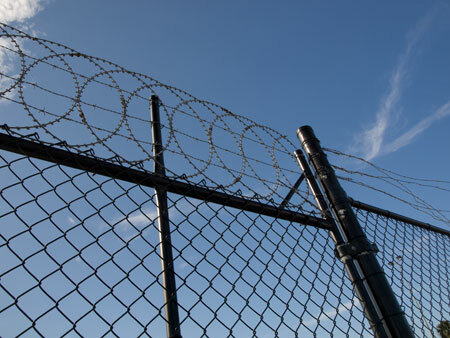 Flying foxes, microbats, birds, possums, snakes & lizards – any wildlife can easily get caught in netting. The nylon cuts deeply into their body causing severe pain. The more they panic, the more injuries they sustain. They cannot free themselves if just left alone. Instead, they slowly starve to death. Having distressed wildlife wrapped up in the netting over your fruit tree can be a very distressing experience. Flying foxes caught in netting are often mothers who have gone searching for food for their babies who they left back at the colony. When the mother does not return, the baby slowly starves to death. All this dreadful suffering is totally preventable. 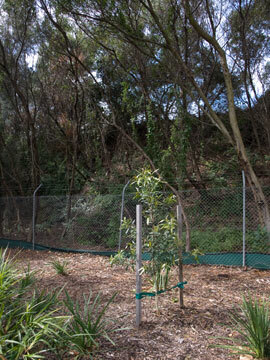 Fruit trees can still be covered in netting by using wildlife-friendly netting. Netting used in the garden should look like fly screen. It should also be white, so the wildlife can see it. Never use black netting. If a child’s finger can fit through any of the holes of the netting, then it is dangerous to wildlife. 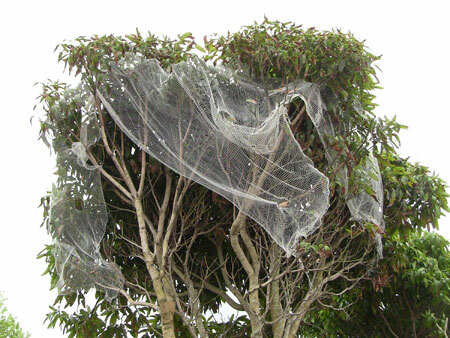 It is important to tie or fix netting at the bottom & not leave it draped over the tree or with the edges hanging. 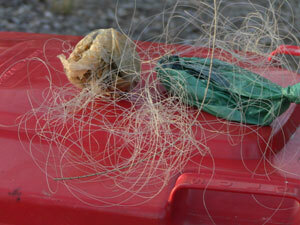 Never attempt to release netting entangled wildlife. You will only be putting yourself at risk of being bitten by a frightened animal likely to be experiencing severe pain. Not knowing how to properly remove them can result in much greater injuries for the wildlife, as well as put you in hospital. Bites can lead to loss of a finger or two. Wildlife rescuers are trained in how to safely remove entangled birds or bats & will take the bird/animal to the vet for assessment & provide care if it can be rehabilitated. WIRES anywhere in NSW: 1300 094 737. 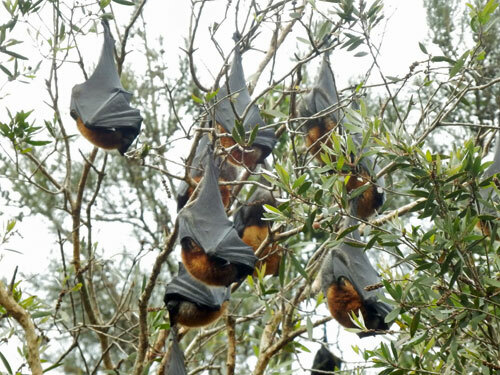 It’s easy to make sure that flying foxes & other wildlife don’t get entangled in dangerous netting. Last Saturday 14th April, a festival was held in the Ring of Figs at Tempe Reserve. This is great. Parks should be areas that bring people together. It’s what is done in the park & most importantly, the condition the park is left in that concerns me. At 4pm Sunday 15th April we went to Tempe Reserve for a walk & what we saw shocked us. 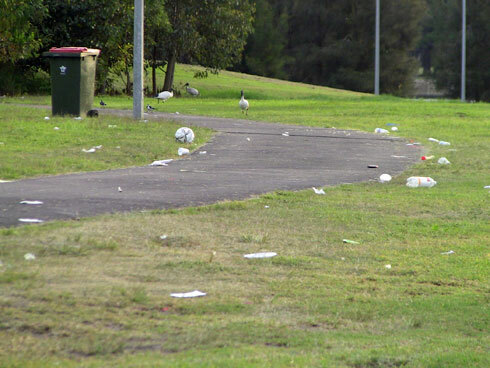 The area around the picnic kiosks at the western side near the boat harbour had more litter than we have ever seen. It was strange to see children & adults playing cricket on the pathway literally surrounded by litter. My pet hate, string, was everywhere & I am not exaggerating. We walked to the Ring of Figs & were greeted by an even more shocking landscape. It is hard to describe. Imagine a huge circle of grass & everywhere you looked was litter. Great piles of plastic food containers, some with left over food spilling out of them, plastic cups, plates, cutlery. Hundreds of plastic electrical cable ties were everywhere. I saw an Ibis trip & went over to see why. Lengths of string & tinsel were scattered around. Two women armed with plastic garbage bags & gloves were working incredibly hard picking up the litter. I spoke to them & learnt that they had arrived at 10pm the night before, picking up litter until 3am. They had returned at 10am & it was now 4pm. That’s 11-hours picking up litter & they were likely going to continue until sunset. In my estimation they would have needed to work another few hours to remove all the bits of tissue, plastic cable ties (I think these held the tents together) & other bits of garbage, much of which had scattered outside the Ring of Figs area. We returned on the following Wednesday 18th & there was a still lot of mess, though most had been mown over. An issue of concern for me is the sharp bits of plastic as these can hurt bare feet so if you use this area, I’d recommend wearing shoes. Gone are the days when we can take off our shoes in the park. Every week a surprising number of local residents spend some time picking up litter, discarded fishing line as well as string from food, birthday presents & party balloons from Tempe Reserve. Each week there is more. I’ve come to accept that many of the users of this park do not respect the park, the river or the environment. 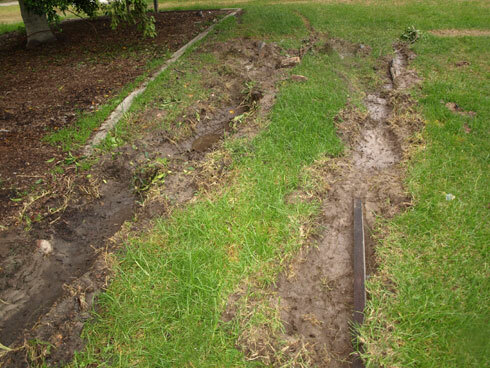 This will not change until Marrickville Council employs a couple of Rangers to educate & fine people if necessary. Once people learn that their behaviour can cost them money, they will stop treating the park like the dump it once was. Seeing the condition of Tempe Reserve last Sunday was like the last straw for me. How can the community keep up when the park is trashed like this? How can wildlife cope when the park becomes a dangerous place for them? 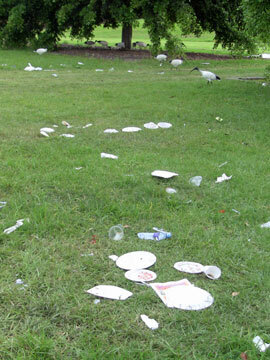 If you leave any park in a mess like this, there are very likely to be consequences for wildlife. Surely, improving biodiversity means providing safe environments for wildlife? 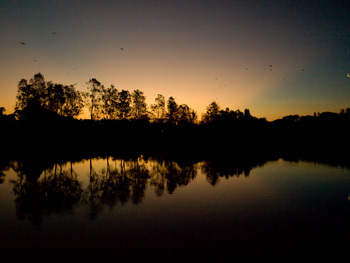 Today is Earth Day & possibly the right time to talk about what has been happening for months at Tempe Reserve. Last October 2011 we noticed an Ibis in trouble. On inspection we saw that she had string netting caught around & under her foot. See photo below. 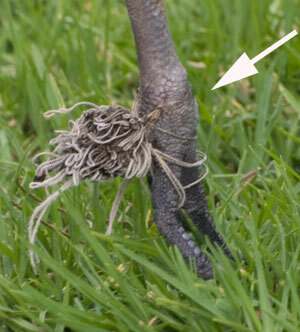 The arrow points to string that has imbedded into the skin of an Ibis with the bulk tangled around her back toe. Then we looked at the feet of the other Ibis & what we saw was very distressing. 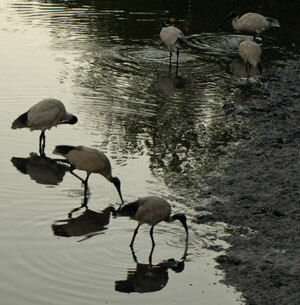 Many of the Ibis who hang about Tempe Reserve every day have string or fishing line wrapped around their feet. They hobble around in obvious pain. The worst was a male who would come near us & show us what was wrong by nipping at the fishing line that had shackled both legs together. Somehow he or another Ibis managed to break the shackle (they do help each other), but 4 months later he is still in terrible pain with line tightly embedded around his toes & ankle. The photo is too bad to publish. Not having any experience in catching wild birds we called government & wildlife agencies for help. We even contacted TV animal rescue programs. No one, including Marrickville Council could help. Their unwillingness to help was threefold: wild birds, lack of resources & the fact that they were Ibis. We eventually got lucky because the local WIRES women came. 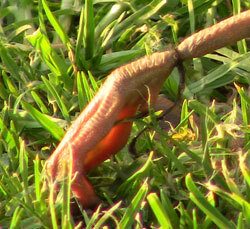 Another example of string injury in Tempe Reserve. This is totally preventable. Our local WIRES group are volunteers who work countless hours with extremely limited funds rescuing birds, reptiles & bats & other urban wildlife from all sorts of situations. They spend a lot of time rescuing bats from barbed wire. Many have to be euthanized because their wings are so badly torn. Often they have babies with them & these babies are hand-reared by WIRES volunteers until they can be released. 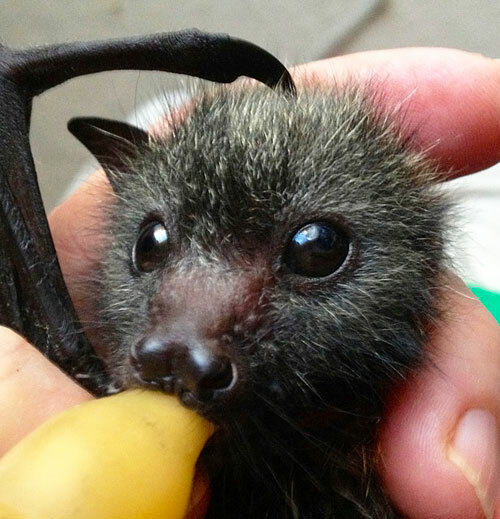 I’ve seen home videos that had me sobbing because of the sweet, loving actions of a mother bat dying just after giving birth, loving her baby until her last breath. You can call me weird. I have no shame being an animal lover. The WIRES women came to Tempe Reserve on many occasions. They also used their contacts & brought in a wildlife rescue officer from the RSPCA. Volunteers from Seabird Rescue came as well. Together we have caught some birds & removed the string or fishing line, but there are more to go & new injuries happened over summer. This length of fishing line had 2 full bags of poo tied at each end telling me that this was a deliberate act meant to cause harm to birds. The clean up of Tempe Reserve on Clean Up Australia Day happened as a result of learning about the state of this park & to try & make it safer for the wildlife. We will do it twice a year from now on. 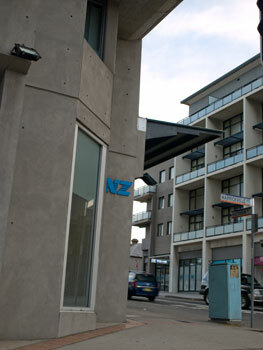 Last Thursday 17th April 2012 a Mayoral Minute was included in the Council Meeting agenda. This was a request from the same organization that held the event in the Ring of Figs on 14th April. They were asking for financial assistance of $1,000 from Marrickville Council to help pay the hire fee of $1800. This was granted as it has been in previous years. This may be well & good. But it does not seem to have worked in this case & in our observations has not worked in other cases. Where communities that use our public parks choose to behave in such appalling ways there needs to be actual enforcement of the threat inherent in the conditions of hire. To have that, Council needs to have Rangers who will visit the park during such events, & after, in order to check the state of the park & actually enforce proper standards. More importantly, it is incumbent on Council to make it a condition on the hirers they make announcements through the day their communities use our public facilities about respect for the facilities, respect for wildlife & ensuring the facilities are left clean. Education of the disrespectful sections of the community is Council’s responsibility on behalf of all ratepayers. Our Council should show leadership by actually taking real measures for positive change. Imagine what Marrickville Council would do if a community group left the lovely timber floor of Petersham Town Hall covered in masses of filth & litter after their event. Why should our parks be treated differently? Today is Earth Day – we should care about these things. 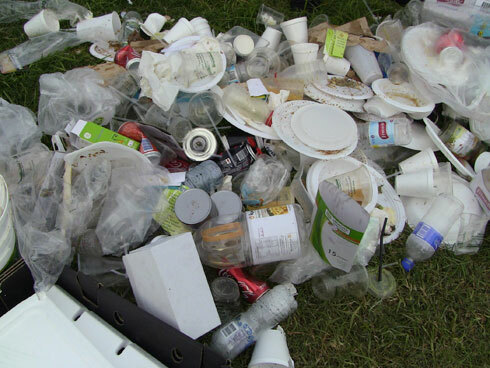 A small part of the litter near the picnic kiosks last Sunday. Another pile of garbage in the Ring of Figs - photo taken around 4pm the day after the festival. You can imagine how bad the park looked before the 11-hours of cleaning. 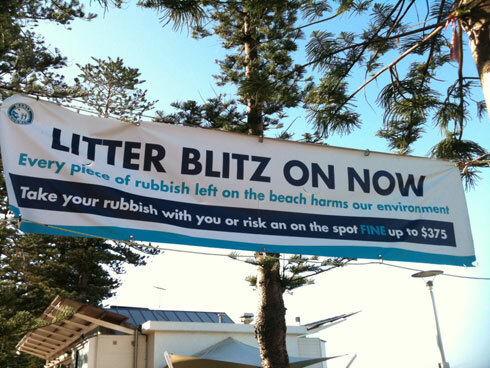 Kristina who left a comment below sent this photo she took at Manly recently. 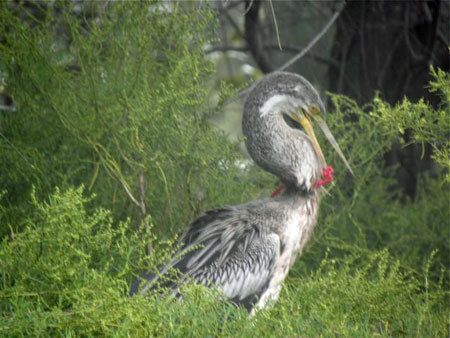 Here is the Darter when first spotted with her beak literally tied to her neck. This would have been a slow & awful death. Photo by Gavin Gatenby. You have probably read the story of Spike, the Darter that was rescued from the Cooks River recently. Well I have my own version. My apologies for the delay in posting this. 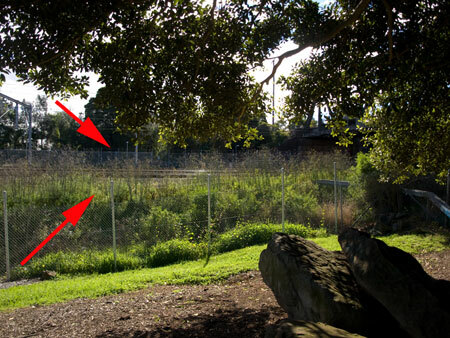 On 19th April 2011 I received a broadcast email from WIRES & Marrickville Mudcrabs – Be on the lookout for a Darter that seems to have something tied around its neck last seen between the Illawarra Road Bridge at Undercliffe & the Wardell Road bridge. I’m thinking, how is anyone going to catch a Darter? I imagined people stalking it & as they got near, the bird taking off into the air. If you have ever come across a Darter on the banks of the Cooks River, you will know that they are big birds when their wings are open & they are super alert. If you go closer than what they deem appropriate, off they go, usually to the other side of the river. So how were people going to catch one? I imagined ongoing reports of a dying Darter, unable to eat & unable to be caught. I’m sure I was not alone in my concern as to how it was to be rescued. My worry was a waste of time. Within 24 hours another email arrived saying that the Darter, a female, had been caught & was on its way to the Central Coast for some medical treatment & rehab. I was so impressed. It’s not easy to find a wild bird along the long stretches of the Cooks River & then successfully catch it. It was Good Friday. The Darter was given a name – Spike. Locals Gavin Gatenby & his partner Lee had gone out in a kayak after spotting Spike. Gavin jumped into the Cooks River (frankly this is amazing) while Lee herded Spike into a patch of mangroves. Gavin then threw a sheet over Spike & the two of them brought Spike to the shore & into the waiting care of WIRES. This all sounds easy-peasy, but I bet it wasn’t. Spike had the red plastic snipped from around her beak & neck & promptly put into a carry box. She was then driven to the home of an experienced sea bird rescuer on the Central Coast for some treatment & to fatten up after an unknown period of not being able to eat & perhaps drink. Exactly, 9 days after Spike after the first email broadcast, Spike was assessed as well enough after rehabilitation to be released. On 28th April, she was driven back to Kendrick Park on the Cooks River to be released to Fatima Island opposite. A small crowd of locals came on a soggy morning to watch & cheer Spike on for hopefully what will be a long, trouble-free & happy life. What was great was that the story was well covered by the Inner West Courier, The Cooks River Valley Times & the Telegraph. The Telegraph had the most amazing & beautiful photo of Spike, her massive wings spread whilst sitting on the edge of the bath while in rehab on the Central Coast. I’ve never seen anything like this photo. It’s always nice to have a good story & this one worked out well because of the vigilance & the caring by local people. Plenty of people were on the look out for Spike once the call for help was broadcasted. Within less than 24 hours WIRES had been organized & agreed to come to pick up Spike even though there was no guarantee she could or would be caught the next day. The WIRES person had agreed to drive to the Central Coast & a volunteer had agreed to take Spike into their home for rehabilitation. Most of these things were unknowns; could be bird be caught today or tomorrow or… How sick would she be? How long would she need to be living in my bathroom? It is my understanding that many people who work for WIRES do so as volunteers. They are unheralded volunteers in my opinion. I doubt the bathroom could be used for the week that a living wild bird was sitting & bathing there. It still makes me chuckle. As for Lee & Gavin – I can just imagine the adrenaline & the hope they had as they set off in their kayaks. It was only quick thinking to herd Spike into the mangroves to prevent her from taking off into the air that made her able to be caught. Then Gavin did the unthinkable & very altruistic act of jumping into the Cooks River. The water would have been shallower near the mangroves so maybe he was walking on decades of dumped rubbish or maybe he didn’t notice. My deepest respect goes to him for this. All of those involved in the rescue of Spike are heroes in my opinion & I thank them. The message in all of this is that balloons, bottles, rings from the top of milk bottles, fishing line, plastic, ribbons, plastic netting & anything else made of plastic, string or material that finds its way into our water ways or the ocean can result in so much suffering & ultimately death as the bird, fish, turtle or other creature that lives in rivers, lakes & oceans slowly starves to death. The stormwater traps along Marrickville’s side of the Cooks River are always full of plastic rubbish. The mangroves along the Cooks River are deep in plastic bottles. Bottles float up & down the river with the tide. It’s sad, it’s unnecessary & Spike’s story has shown how dangerous it is to wildlife. It takes up to 450 years for plastic bottles to decompose & up to 600 years for fishing nets & lines to decompose, though who really knows? It may actually take longer. If you want to join Mudcrabs & help them in their endeavor to clean up the Cooks River, you can find their contact details in the Blogroll on the left of this page. Fabulous almost cement-free car park in Croyden with a shade tree for every 2 spaces. Rain gets to be absorbed into the ground rather than washing down storm water drains. Is there something wrong with me? Why remove 2 Palms in a car park? We need trees to at least break up some of the grey infrastructure in a car park. 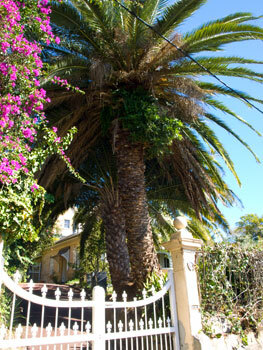 A car space either side of the 2 Palms could have been made into a garden so that Ibis poo didn’t fall on parked cars. Sure these birds are messy, but I have stood beneath a number of trees located on grass where Ibis nest & there is no mess to speak of. Concrete is a different matter. The workers sent to remove these trees & WIRES deserve applause for doing what they could do help these birds. Thing is, I don’t believe it was necessary for them to go in the first place. WIRES constantly have to deal with people & organizations who want what they want at the cost of habitat for wildlife & often resulting in the death of wildlife. That WIRES had to remove 9 chicks from their parents to be reared by humans before being released is pretty sad. It’s not as though the chicks didn’t have parents. They did, but for the sake of a neat car park that Harvey Norman wanted now, the adult birds had to lose their chicks & the chicks lose their parents. This would be okay if you believe that only human beings have emotions. Sydney because of the drought. They had to come because they had nothing to eat or drink. Could you expect them to do anything different? Harvey Norman in Auburn caused all this simply for a nice, neat treeless car park. Cement wins once again. The time will come in the future where people will respect commercial businesses that make space & create or keep habitat to share with urban wildlife. Right now, few people probably care, but to me, this whole affair stinks & is cruel. No wonder there was no information to be found on the net. I wouldn’t imagine that Harvey Norman would really want people to know about this as it may negatively impact on their image. I thank the Inner West Courier for bringing this issue to the attention of the public & to WIRES & the other workers who did what they could to help these poor birds. 50 years ago the Sydney Basin had extensive habitat for urban wildlife. 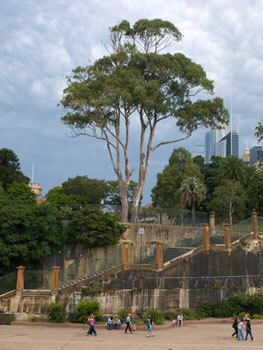 There were Sydney Blue Gum High Forests along the ridges from Crows Nest to Hornsby. 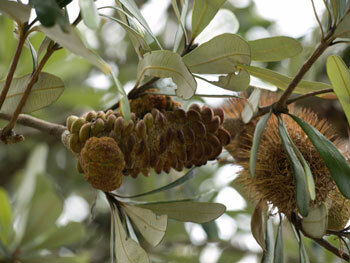 Today this species of tree is on the critically endangered list. Despite being on this list, I know that 4 x 61 metre (200 foot) Sydney Blue Gums were chopped down for a development at Wahroonga last March. The woodlands of the Cumberland Plain between Parramatta & Penrith are almost gone with the community fighting Blacktown Council unsuccessfully to prevent the removal of more 100 plus-year-old critically endangered trees for 2 football fields in Glenwood last April. Not to be left out, Penrith City Council recently approved the removal of more than 300 hectares of the critically endangered Cumberland Plain woodland from the ADI site for a new suburb to be named Jordan Springs. The community are protesting this too, yet 10 hectares of trees have already been removed. There were salt marshes & fresh water swamps on the western side of Botany Bay. Most have been filled in & developed for the airport, for golf courses & for housing. Even our back yards have changed with a trend towards paved, concreted gardens or covered with decking. Anyone aged 50 & over who grew up in Sydney will know just how much Sydney has changed. I played in a natural creek in amongst thick bush where there is now a 6-lane highway. In another family home, a horse lived 5 doors down. Many people owned chickens & grew their own veggies. Most ¼ acre blocks had multiple tall trees & they were not looked upon as a threat to life & property. Admittedly, there are still suburbs where gardens are heavily treed, but I maintain the do-it-yourself renovation trend has been to remove these trees & neaten gardens. Leaves are a problem for many people. Our governments are pushing for massive population growth & demanding more development for housing. As the population increased, our green areas decreased as well. I think it is likely that these remaining green areas will also come under threat of development. I remember reading last year that the proposed light rail through Rozelle & Leichhardt intended to use parks along the way for stations. There was an outcry from the community & I think the parks have been left alone in the final plan. 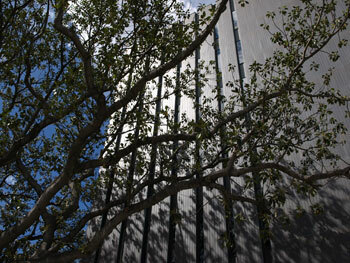 As I write this post the TV news is talking about the loss of Sydney’s ‘green belt’ to development of high-rise units. It’s non-negotiable despite opposition from great chunks of the community & many Councils. Housing developments are generally not built with significant green areas & space, like they are in London & New York for example. 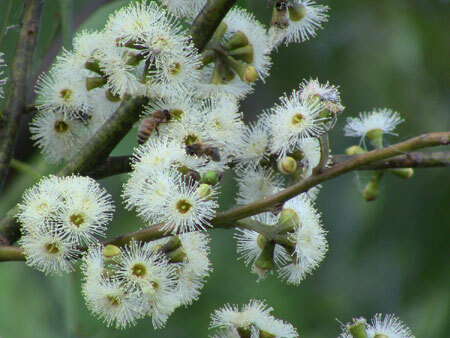 When trees are used, they are often ornamental & of small stature. 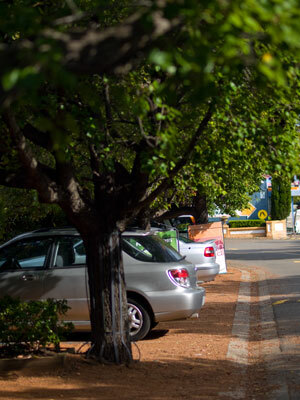 Tree species such as Prunus & Ornamental Pear are being planted as street trees because they have a straight growth habit, have thin branches which can be easily pruned & do not have a shade canopy. 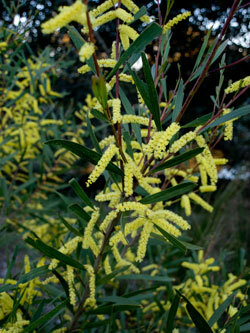 However nice they look, especially in autumn, they do not provide food or homes for birds & native animals. Urbanisation has removed much of the food sources our wildlife depends upon to survive & has made many species of birds & animals extinct or placed them on the vulnerable, threatened or endangered species lists. For most wild birds & animals, it is not as simple as finding somewhere else to live as each has their own territory & do not take kindly to interlopers arriving as they are a threat to the limited food sources. Generally they fight until one either dies or leaves. Yesterday I read an article about possums in last weekends Sunday Herald 23rd May 2010 – “There is an epidemic of possum napping as an increasing number of residents illegally trap the troublesome marsupials then dump them in city & suburban parks.” Unfortunately, because of territories, this is usually a death sentence for the possums. People who are caught can be prosecuted under the Cruelty to Animals Act. If a possum has set up home in your roof space, WIRES can humanely trap them for you & take them outside to an appropriate tree. This is not something which should be attempted by anyone but trained experts. Not only is a terrified possum quite capable of putting you in hospital for a few weeks, you may inadvertently leave possum babies behind leaving a bigger problem for you to deal with later. The thing is, if there are decent trees for possums to live in, they are happy to do so & won’t be looking to live in your roof. Making roof space secure against possum invasion is easy & quite cheap with the benefit that birds like Indian Mynas won’t use it either & rats & mice are also kept out. Snakes too. Last year a very young Ring Tailed Possum moved into a street tree near us. No one but us knows where it is & we only do because it visits us occasionally. It causes no trouble in the neighbourhood other than eating a few petals. There is no noise, no poop on cars, no damage to property. The only evidence is the occasional collection of small branches. My neighbour is pleased with what she thinks is my cleanup work. Just today a good friend said, “Why would you want possums in the area?” My answer was because this is their home too. Living next to a park, he undoubtedly has many possums scampering through his garden & street at night & he sleeps through it. They make no negative impact on his life. Possums are only a problem if they set up house in your roof & this is something easily & cheaply managed. It is my opinion that Councils should be planting street & park trees that provide food & good homes for urban wildlife. Not always, because certainly there are some streets & roads where another type of tree is more appropriate, but on the whole, trees should be chosen for their ability to provide food & homes for our wildlife. I don’t think Councils can rely on the residents to do so. However, I also believe Councils have a role in encouraging residents to plant bird & wildlife supportive trees/shrubs/plants on their property via education & community programs. Developers should not be able to have DAs passed without significant green spaces as a requirement. It would be nice to see real creativity in new buildings. Glass & brick blocks do very little for the landscape. Roof gardens, gardens on different levels, buildings which are set back from the street so there can be green space in front where cafes/restaurants can set up tables or where shoppers can meet, have a rest etc. Research has shown shoppers spend an average of 11% more in green leafy shopping strips, so this change in design has a real potential to make significant money for businesses. I digress. Suffice to say, there is going to be a lot more development, especially high-rise residential. As this will decide what the city will look like for the next 100 years, now is the time to say no to the ugly blocks, the cold modern glass. We should demand apartment buildings that provide a good lifestyle. We also have a responsibility to design developments with urban wildlife in mind. It doesn’t take much. Plant the right trees, ensure they flower & plant so that something is in flower for each season. Plant undergrowth at different levels, use both shrubs & native grasses & dispose of the wall-to-wall, corner-to-corner cement. Unfortunately, none of this is likely to happen unless the community make it really clear this is what they want. In time, I believe we will all want it because global warming & the Heat Island Effect is going to bring this to the forefront of the mind of the majority. Essentially, it’s going to get very hot. Then we will notice that most of our street trees give little shade & there is a proliferation of cement. 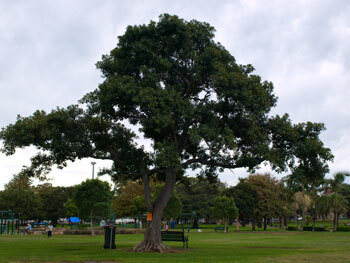 An old Port Jackson Fig (ficus rubiginosa) near the rocket play area in Enmore Park Enmore is up for removal. We went to have a look today. The Fig has a cavity in the trunk where it meets the soil. It would make a perfect home for a small animal in a forest location. trunk. Unfortunately 70% of the base of this particular tree has decayed. 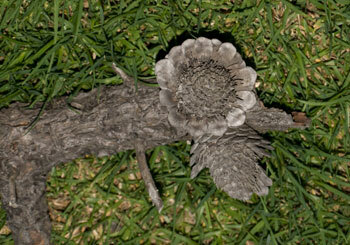 The hollow has also travelled 67% up the stem of the tree. Both factors make it a high risk of falling, particularly if placed under stress like high winds. The report does say the tree can be pruned to remove weight, but says the tree would have to be topped with the side branches lopped & kept in this condition. Therefore, it would never regain a full tree shape again. Erecting a fence around the tree to protect the public was also an option. Neither of these actually would improve the look of the tree & amenity of the park, so the advice is to remove the tree. 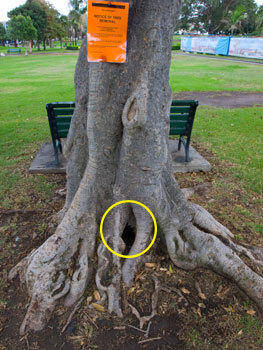 Marrickville Council intends to replace the tree with an advanced Port Jackson Fig at the same location. I am pleased Marrickville Council made the Tree Report freely available to the public with the Notice of Removal. The Notice of Removal on the tree had clear information about the reasons for removal. Unfortunately, they nailed the signs to the tree, which is a bugbear of mine. Council recently started using tape to secure the notices on the trees, but has returned to old habits. All in all, the information provided to the community is thorough & I thank Council for this. At the very least, it helps people like myself understand why this tree needs to be removed. The Tree Report was also written in a way that was easily understandable & was in itself, a great learning resource. The period for submissions is only 2 weeks & closes Friday 7th May 2010. SoT will not be putting in a submission. 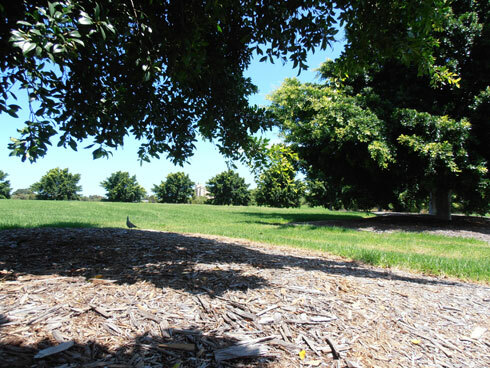 Update – IKEA Fig trees – I have been on the search for information about the Post Jackson Fig & the 2-3 massive Hills Figs on the grounds of the new IKEA development, Princes Highway Tempe. As this was a DA, Parks & Gardens did not know what has or is intended for these trees. They gave me the contact details for an officer in Planning who told me that the only tree which was referred to in the DA requirements was the Morton Bay Fig tree. This tree is to be relocated outside the staff recreation room. This explains why the tree is sitting perched up on the original soil with the surrounding areas outside the tree line excavated. As to what happened to the 2 or 3 massive Hill’s Figs, no one knows. I would presume they fell victim to the chainsaw, which makes me very sad. Judging by the amount of birds that roost in the 2 Mackey Park Hills Figs, these trees would have also been the homes for thousands of birds. Now, they are most likely lost to concrete & bricks & mortar. I guess it depends on one’s priorities, but I don’t think trees feature highly in development. Trees get in the way. It’s as simple as that. 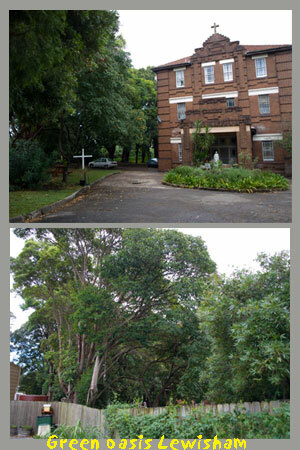 I will try to contact Marrickville Council’s heritage expert to see if I can find out more about these trees. 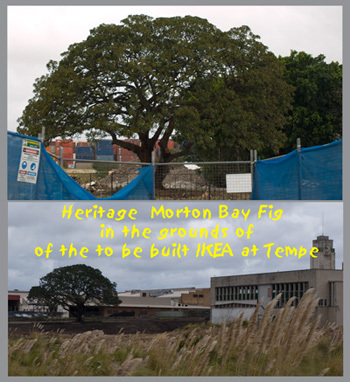 Marrickville Heritage Society is also concerned about the Morton bay Fig, but was unaware of the presence of the Hills Figs. Most of us were similarly unaware, because they were hidden behind 2 storey buildings for decades. Update: Bandicoot habitat Lewisham – The trees that were due to be removed as part of renovations at the St Vincent’s de Paul Head Office in West Street Lewisham are still standing. I did read in the Inner West Courier about 1 month back that they were working with local WIRES to help keep the Bandicoot habitat. It’s excellent to see an organisation making an effort in response to the community’s concerns with regards to threatened species. Marrickville Council approved their DA & they could have legally gone ahead with the destruction of this little group of Bandicoots’ habitat. We had a look today & saw other church properties that are filled with large trees. It made me realise just how important these old established grounds are in built-up urban areas. Over the years, we have lost so many large trees from front & back gardens, from streets, from properties that have been knocked down & rebuilt & from areas that were once vacant space. While suburban environments have changed, places like the grounds of St Vincent’s de Paul still function as a green oasis in what is becoming predominately bitumen, cement, bricks, glass & steel. Callan Park in Leichhardt LGA is also a prime example as the grounds are still as they were 50 years ago, except the trees have grown to become magnificent. To lose these green places will be devastating in more ways that one & not just to the urban wildlife. 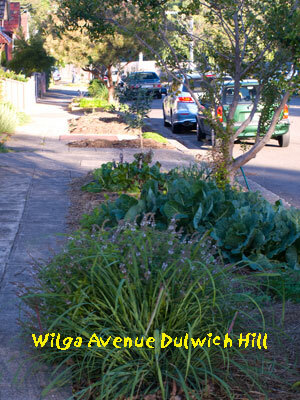 Last week residents of Wilga Avenue Dulwich Hill were given a grant of $1,000. See Report from the Gallery – 20th April 2010. Photo below.